In a world where a large majority of young riders choose to ride super-sport motorcycles for their looks and outright performance, Yamaha managed to break the mold. Seemingly countless motorcycle journalists have praised the MT09. Some even choose to call it the “Hooligan machine,” thanks to its nature. The point I’m trying to make is that MT09 is quite an attractive motorcycle for young riders, myself included. After five years of being without a motorcycle (I will explain how that happened later) I decided to buy a brand new 2018 FZ09 (MT09 technically). In three months I racked up over 5k miles. Here are my thoughts so far. Let me start this off by saying I am not a motorcycle expert by any means. I’m a car-guy who also happens to like motorcycles. I’m not an expert club racer, and this is only my second motorcycle. This doesn’t mean my opinions are worthless, but they’re from a “regular” guy perspective. I wouldn’t consider myself a beginner, but I wouldn’t consider myself an advanced rider. My first motorcycle was a Ninja 250, and after the engine of that exploded on the highway, I sold it and stayed without a bike for over five years. When it came time to buy a new bike I knew I didn’t want to get a small bike again, so I chose the MT09. The thing is, relearning how to ride on this particular bike was probably not the best idea. 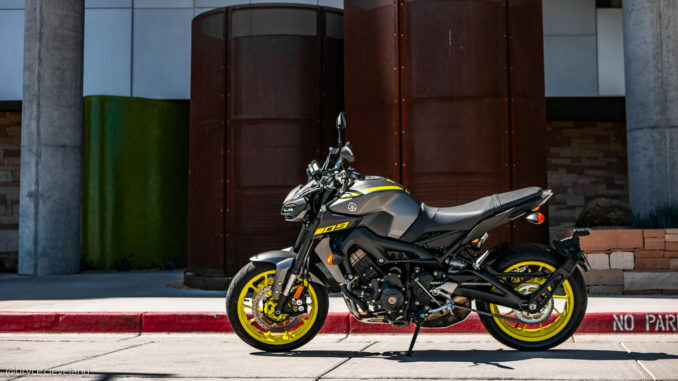 If you’re a beginner out there thinking about getting an MT09 for their first bike, don’t. Coming out of corners the MT09 likes to slide or wheelie and sometimes it will do both. It has WAY too much torque for a beginner, but that’s what makes it so darn fun. Sorry newbies. For a lot of us, myself included, the aggressive position of a super-sport is uninviting. An upright bike the MT09 has 98% of the performance of a super-sport (not an exact number, obviously), but without the cramped up and bent over riding position. Plus, with my bad back, I didn’t want to be hunched over like that for long periods of time. You get the point I’m trying to make: the MT09 is very upright and very comfortable. 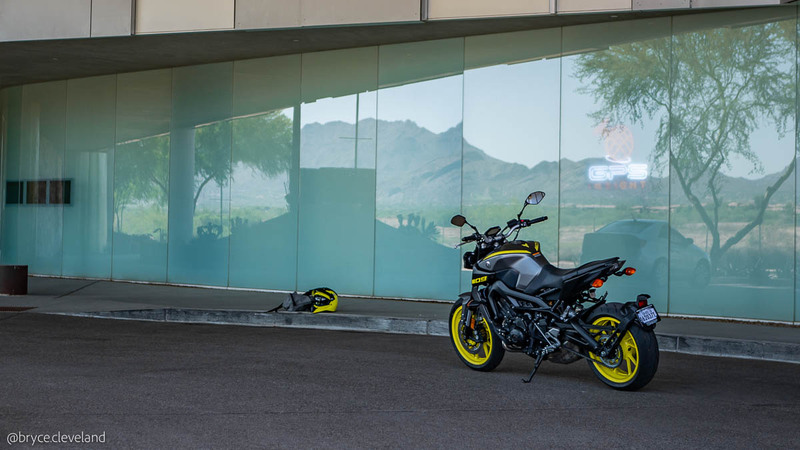 The MT09 is as upright as a dirt bike, and the bars are very wide. This means low-speed maneuvering around town is super easy and fun, unlike super-sports where it can seem like a chore. This also means you can ride the MT09 all-day long without your back and wrists aching by the end. Unfortunately, this super upright riding position in combination with no wind protection makes highway riding somewhat annoying. Luckily you’re not forced to be super upright, so when you hit the highway, you need to tense up your core and lean forward a bit. If you want a more bent over riding position, there are a few aftermarket bars to choose from which are flatter than the stock handlebars. You can also go all the way to clip-on handlebars for a super-sport like riding position, but those aftermarket clip-on bars barely clear the tank (some even contact the gas tank before full lock). The MT09 is designed to have a comfortable, yet slightly aggressive riding position and I think Yamaha nailed it. 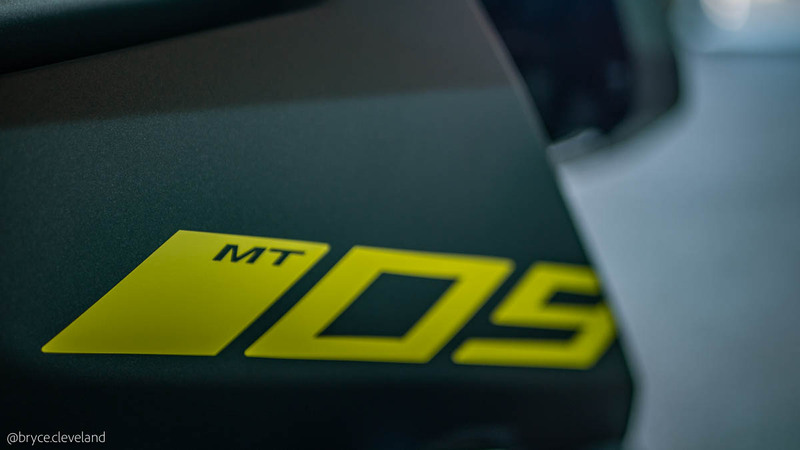 The thing that makes the MT09 so unique and special in the three-cylinder engine that powers it. The first “big” bike I ever rode was a Triumph Speed Triple with a few minor mods done to it. Riding that bike and experiencing a three-cylinder engine left a massive impression on me, and ever since I’ve wanted more of that three-cylinder goodness. 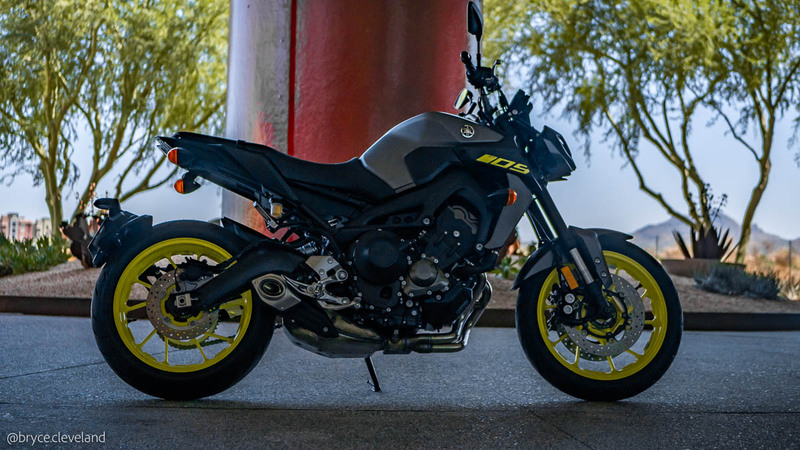 The 847cc three-cylinder that powers the MT09 makes 115 horsepower at 10,000 RPM and 65 lb-ft at 8,500 RPM. If you’re familiar with bikes, you know that puts it near 600cc super-sports as far as top end power. What makes the three-cylinder design so lovable is the torque curve. Although a modern 600cc might make a touch more top end horsepower than the MT09, it only makes that power at the tippy-top of its rev range. This means at low to mid RPM, where the bike spends the majority of its time, there isn’t much power. Three-cylinders are different because their torque curve is much flatter. 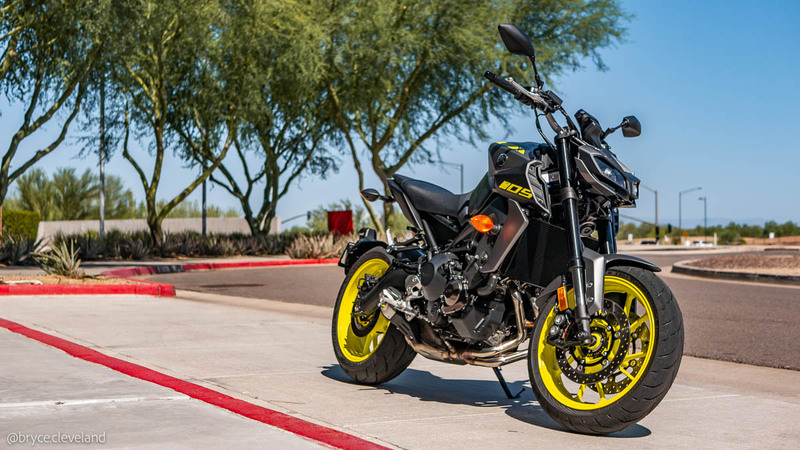 This means most three-cylinder bikes (especially the MT09) have gobs of low and mid-range power which makes riding around town stupid fun. On top of the amazing power curve, three-cylinder engines are also very smooth and have a unique sound to them. It’s a little hard to explain why a three-cylinder is awesome without a bike present. I recommend everyone to experience a three-cylinder bike. You might think that low-end torque is not worth the slight decrease in peak power, but trust me, you’ll love it. The engine of the MT09 is truly something special. I could go on to talk about the chassis and the suspension, but it would just be me saying I like it other than the rear suspension being a touch squishy which can be fixed by adding preload. Overall I think the MT09 is a fantastic bike for an intermediate or expert rider. The torque makes it hilarious fun in the city, and the riding position allows me to ride for hours on end. For me and many other riders, it’s the perfect bike. I look forward to racking up some serious mile on it and hopefully some fun mods in the near future! Bryce founded Dust Runners Automotive Journal in 2014 as a way to write about the cars he found interesting. When he's not writing for Dust Runners he's writing for Power Automedia as a freelancer. He currently drives a 2015 Fiesta ST and absolutely loves it. Falken Azenis RT615k+ Tire Review – Worth the Hype? Bryce Cleveland on M3 vs M5: Which One Is Better and Why? Richard on M3 vs M5: Which One Is Better and Why? Dalton on VTEC vs. iVTEC: What’s the Difference?